Purple’s YouTube channel is basically a masterclass in YouTube marketing. 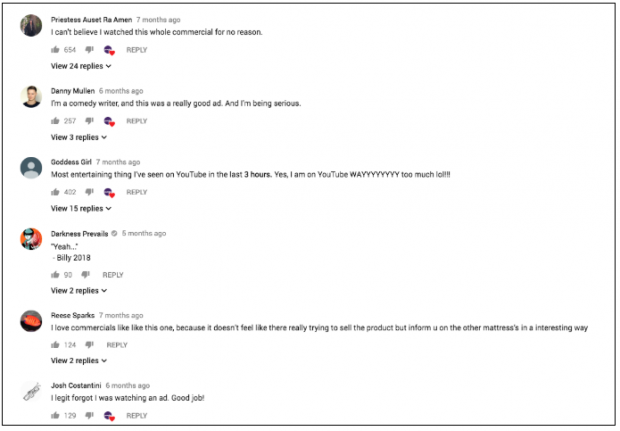 Who thought videos about mattresses could be so popular? 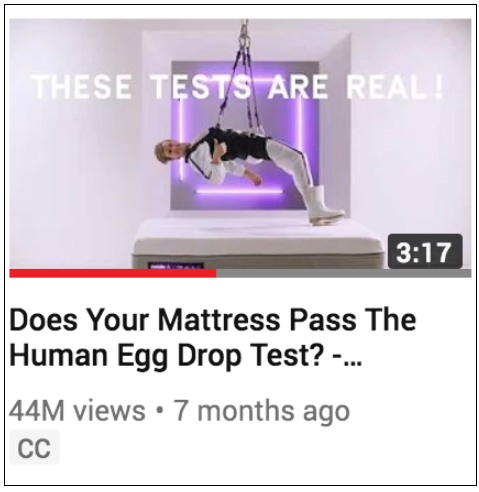 At 44 million views, “Does Your Mattress Pass the Human Egg Drop Test?” is one of Purple’s most successful marketing videos. It’s basically a wacky lab experiment: a guy with unbroken eggs strapped to his back is dropped onto a mattress, and the eggs remain intact. Source: Purple on YouTube. Note how they’re liking top comments to foster engagement! The comments section on this video is overwhelmingly positive. In fact, the Human Egg Drop Test was so popular that it inspired a wave of videos showing people trying Purple’s experiment at home—successfully!—for themselves. Purple’s YouTube marketing is incredibly successful simply because their ads don’t feel like ads. If you’re planning on using YouTube as a conversion funnel, keep entertainment value front of mind. People aren’t going to subscribe to or share your content nearly as often if every video feels like a hard sell. Court your demographic and with fun, engaging, informative videos they’ll actually benefit from watching. This is how you build brand loyalty. Ikea’s marketing game has always been on point, and their YouTube presence is as well-crafted as their shopping experience. The Swedish furniture company has a knack for jumping on trends and making them their own, without being gimmicky. The autonomous sensory meridian (ASMR) response is a tingly, relaxing feeling triggered by specific sounds and visuals. ASMR videos are huge on YouTube. Over 5.2 million have been uploaded to the platform, and they’re watched all over the world. IKEA’s marketing team was smart to use ASMR to sell dorm room furniture. What better way to showcase a relaxing bedroom to Generation Z college freshers? IKEA’s marketing team consistently finds and adapts viral trends that fit naturally with their brand. So how can you do the same? When planning YouTube content, consider exploring your subscribers’ favorite channels for inspiration. Watch their videos to better understand your target market and what they want to see. You don’t need to worry about your own videos going viral; a nod to a popular trend can often be enough. Focus on creating consistently good content and your YouTube channel will grow. Warby Parker built a name for itself by challenging conventions around shopping for eyewear, and they’ve seamlessly translated this brand onto YouTube. A big part of Warby Parker’s marketing strategy involves partnering with influencers and other brands. They’ve teamed up with everyone from Kanye’s creative director Virgil Abloh to luxury department stores like Nordstrom. Warby Parker’s YouTube channel features video profiles of creative professionals proudly wearing the eyewear brand. Each person has been carefully selected to project the sense of effortless cool the brand is known for. When you’re marketing your own product on YouTube, partner with influencers or other interesting people who are enthusiastic about your brand and fit your target demographic. You don’t need to stress about working with huge celebrities, either. In fact, niche influencers might even prove more effective for your brand. 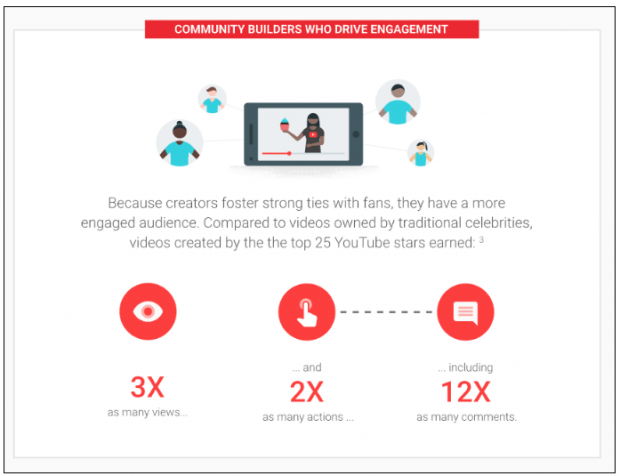 Just look at this Google infographic, which shows how YouTube creators foster closer relationships with their fans than traditional celebrities. Another lesson we can learn from Warby Parker is that it’s okay to experiment with your brand, and even misstep occasionally. Earlier this year, Warby Parker teamed up with Arby’s to form “WArby’s”. Yes, it was an April Fool’s joke—and not everyone got it. Still, the “WArby’s” prank showcases Warby Parker’s willingness to be creative and have fun with their brand, which is never a bad look. Gordon Ramsay’s a huge TV star, but did you know he’s killing it on YouTube too? His YouTube channel has almost 8 million subscribers and close to 1.3 billion views. On offer is a mix of Ramsay’s trademark restaurant rampages tastefully paired with recipe videos shot in the chef’s home kitchen. Everything about Gordon Ramsay’s YouTube presence is entertaining, but there’s one especially important point to consider about his channel. Every single video is carefully curated to build a balanced portrait of the famous restaurateur. We know from TV shows like Hotel Hell that Gordon Ramsay can get a little angry sometimes. But when you watch his YouTube videos, you get to see his softer side. Gordon Ramsay’s one-on-one recipe videos are surprisingly intimate, with none of the rage you see on Kitchen Nightmares. When he’s teaching you how to make granola, it’s easy to forget that he spends a lot of his time making chefs cry. This is how you take a personal brand to the next level on YouTube. Gordon Ramsay leveraged his hotheaded persona to build a multimillion dollar culinary empire. His YouTube channel cultivates a different image, showing there’s more to Gordon Ramsay than his fiery temper. If you’re hoping to build a personal brand on YouTube, take care to show the various facets of your personality through your content. Doing this will help you form a deeper connection with your subscribers, who will feel like they’re getting to know you better every time you post a new video. Japanese game company Nintendo is one of the top 10 brands on YouTube, with a subscriber count approaching 5 million. The company started getting serious about YouTube marketing with the launch of the Nintendo Switch, and it’s been central to their most successful marketing campaign in years. Nintendo’s YouTube Live events are a huge reason for their success on the platform. Unlike other big players in their industry, Nintendo generally doesn’t have a huge presence at gaming expos. Instead, the company hosts a short (30–60 minute) YouTube Live event every couple of months known as the Nintendo Direct. Happening several times throughout the year, Nintendo Directs are extended news events where fans can get an inside look on what’s on the horizon at Nintendo. Following trailers and commentary, fans are invited to tune into a separate livestream, the Nintendo Treehouse, where a panel of hosts play the title together live. Nintendo Directs are special for their subscribers because everyone gets to experience big reveals simultaneously, without having to schlep to a convention. This YouTube strategy is (so far) unique to Nintendo, and it’s hugely effective, triggering massive engagement across their social channels following each event (the memes are real). Nintendo’s built an incredibly strong, unique brand over the years—they’d have a huge following even without YouTube. What’s interesting is how they use YouTube Live events to generate hype and whip their fans into a frenzy. Nintendo schedules and announces Directs well in advance, so there’s plenty of time for excitement to build. When they happen, fans are provided with huge amounts of information to pore over and dissect on Twitter and Reddit, and the hype train runs at full speed until release day. Well-timed videos and regularly scheduled content works wonders for fostering an engaged, passionate YouTube audience. Monitor your analytics to see when your subscribers are most active, and plan new video releases around those times. Make sure the content you’re posting on YouTube offers unique value your subscribers can’t get on your other channels. Build a content calendar and reserve some of your bigger announcements for YouTube. Give people reasons to keep coming back to your page! Plan and schedule your YouTube content with Hootsuite. It’s easy to quickly publish your videos to Facebook, Instagram, and Twitter—all from one dashboard. Try it free today.